When I was about 12 or 14, my family used to travel all the way from Down Neck to Corona, New York, to visit some friends. I don't remember who they were, but I do remember that we made several trips over there. 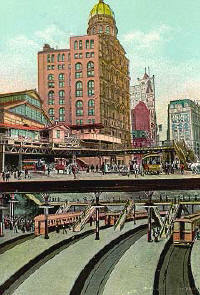 We would start out at 663 Market Street, go to Park Place, and catch a subway to Cortland Street in lower Manhattan. At Cortland, we would exit the subway and walk to Park Row, which is at the foot of the Brooklyn Bridge. Here five or six trolley lines came together after crossing the bridge from Brooklyn, Queens, and other places in Long Island. We would board the Corona trolley, which was marked with only a number on the front of the car. After about an hour's ride and many stops, we would finally arrive at our destination. Our friends lived a short walk from the trolley station. After a three or four-hour visit, we would retrace our journey home. 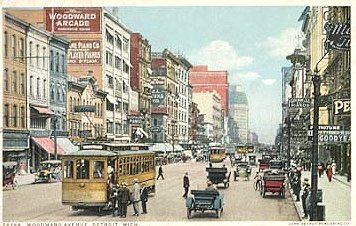 Since we made this trip many times, I began to memorize the landmarks, the different streets, buildings, and the trolley car. It wasn't long before I felt that I could make the trip by myself, without any assistance or mishap. My parents were reluctant for me to go alone, but I finally convinced them that I could do it. So one day I went to Corona, New York alone, and took a gift from our family to their family. I made the round trip safe and sound and was very proud. It was a feather in my cap. Then there were the trips to Coney Island for a few days at the beach. We would leave Down Neck early in the morning and search for an apartment for our family to stay in for a week or a weekend. We wanted the best price and the best location. It had to be no more than a block to the beach. At that time, efficiency apartments for three or four people would cost about $10 to $15 for a weekend. It was quite a task carrying boxes of food and clothing with us, but we would always have a good time. We never purchased our food at the beach because it was mostly kosher and didn't fit our life style. Some of our friends would find out where we were staying and look us up. We would join forces with them and have many good times together. Coney Island was noted for its beaches, boardwalk and fast restaurants. One of them, Nathan's, was known throughout the nation for its fast food, good service, and cheap prices. Its famous hot dogs were three cents apiece, or two for a nickel. Sodas were three cents. Mustard, ketchup, and relish were free. You had to stand in lines three deep in order to get served.